Designs which aim to "future-proof" a Birmingham railway station have been revealed. Moor Street could be redeveloped to make way for growing passenger numbers and create links to Birmingham New Street and planned HS2 services at Curzon Street. 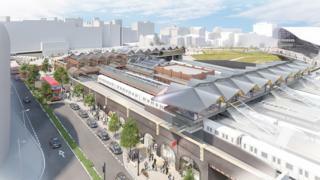 Its concourse will be doubled and two new platforms created under new plans. There would also be increased capacity to and from the East Midlands, Hereford, Worcester and the South West. Developers are seeking funding for the project and no date has yet been set for completion. A second entrance is also planned to the south of the station, but the designs keep the station's Grade II listed entrance and concourse, which dates back to 1914. Midlands Connect, the body behind long-term transport plans for the region, said it "future-proofs" the station, where passenger numbers are expected to grow to 12 million a year within the next 24 years, with further increases expected with the arrival of HS2 in 2026. The initial plans have been developed by West Midlands Rail Executive in collaboration with Transport for West Midlands, Midlands Connect, Network Rail, HS2 Ltd, Chiltern Railways, West Midlands Railway and Birmingham City Council. Tom Wilne, project director at HS2 Ltd, said: "We're pleased to see plans progressing for Moor Street station and look forward to continuing to work with our partners across the region."